Here it is Team Stryker fans! 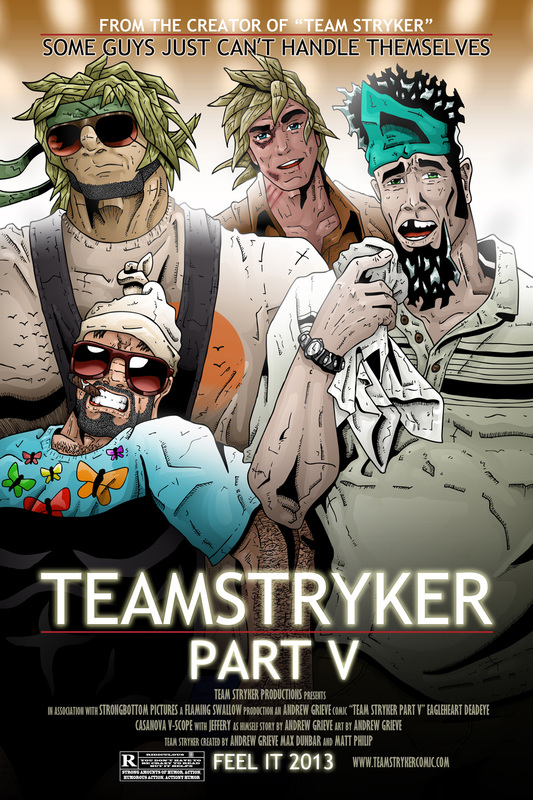 You’ve waited patiently and I’m happy to reward you with the world wide debut of Team Stryker Mission 005! This has been a long time coming as I’ve had the idea for this entire issue since 2012. The idea for the cover, however is a recently new development. When I first wrote the issue I had no idea what I wanted the cover to be so I left it and started work on the interior pages instead. It wasn’t until I had finished the first 12 pages of the issue that I came up with an idea worthy enough to be the cover of Mission 005. Hopefully it’s obvious that this my homage to the original Hangover movie which should give you an idea as to where this issue takes place. It was an exciting challenge to try and blend Team Stryker with the cast of The Hangover in a way that does both of them justice. I tried a few attempts with other movies but The Hangover fit so perfectly there was no other option after I tried it. It was quite a balancing act to decide how much likeness I should take from Zach Galifianakis, Ed Helms and Bradley Cooper and still have them look instantly like Team Stryker. In the end I tried to simply capture their essence and expressions more than their actual likeness. It wasn’t until I had added the final colors, titles and effects that it really started to look like The Hangover which was a huge relief for me. I hope you all enjoyed your first look at Team Stryker Mission 005 and be sure to tell me what you thought in the comments below!